Hello everyone. My name is Rebel, and I have been visiting Little Orchard Village for the past six years, at least twice a year. 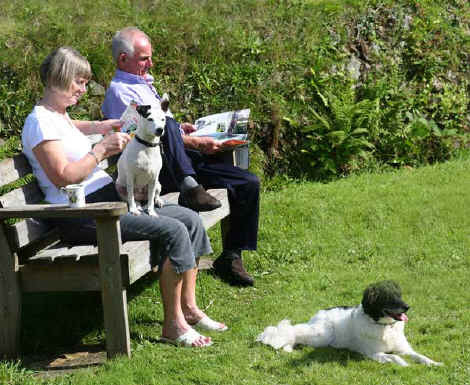 On my second visit in July this year, we had hardly had time to unpack when some strange bloke came up to my owners, Malcolm and Glenys, and asked them if I could be photographed for the Little Orchard Village website. The cheek of it all - he didn't think to ask me, if I wanted to become a celebrity or not. To cut a long story short, my owners agreed that the Photo session should take place, with this photography fellow, at seven o'clock the next Monday evening. 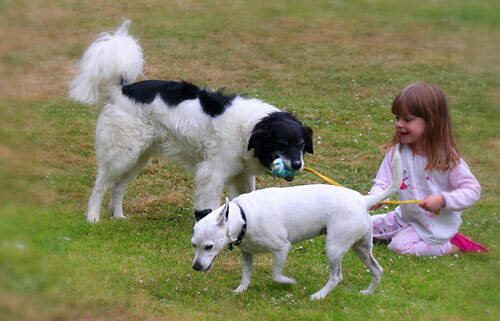 On this visit my owner's son and family were also staying at Little Orchard village with their Jack Russell named Snoopy. I just had the feeling that on the day of the 'photo shoot' Snoopy would try to get in on the act - I was not wrong. 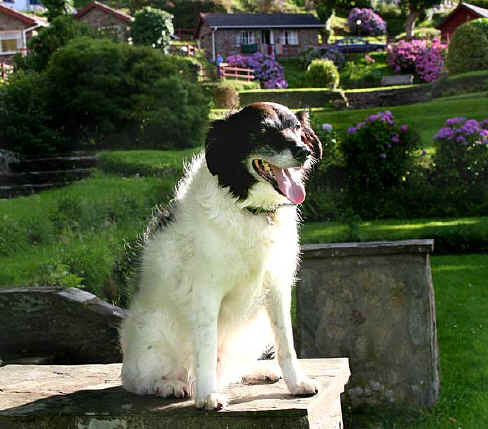 The plan was that four pictures should be used on the website, a picture of me with the some of the chalets in the background, one of me playing on the lawn, then one of me with my owners relaxing, and finally a shot of me and my owners with some chalets in the background. It started off Ok. I was told to sit on one of the stone pillars and just pose. Then it was 'try to look happy' , 'Don't look at the camera' and 'try to show your best side'. I must admit I did get a little bored, but it was worth it - I think you must agree, I do look rather handsome. (please see picture above). 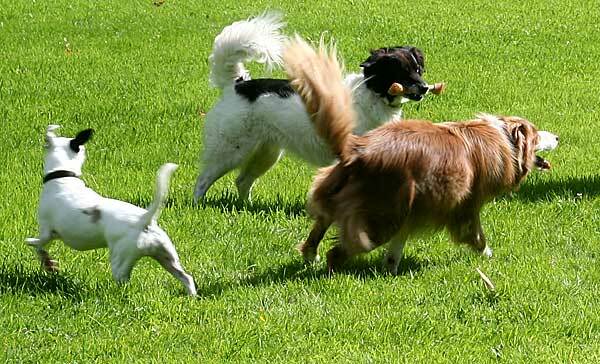 Then came the shot of me playing on the lawn - suddenly Snoopy appears as if from nowhere with another canine, and this was supposed to be my day of glory. The next shot was supposed to be me sat between my owners on a seat. But no, Snoopy also muscles in on this one as well. So in disgust I went and laid down about 20 feet away. But the photo chappy just took the picture and then did what he called a 'Cut & Paste' so it looks as if I'm sat at my mistress' s feet, and Snoopy steals the limelight. As you can see from the final picture below, I did get a little fed up with all this picture taking for the website. Looking back it was worth it as I still think I look great in the first picture. Hi again to all you web-surfers. I cannot believe it was back in July 2007 that I became a Star on the World-Wide-Web. Yes I have really enjoyed my stardom. I was really looking forward to coming down to Little Orchard again in 2008, but unfortunately my mistress Glenys suffered a stroke therefore I was unable to get down in that year. (I do understand that my family comes first). I'm now pleased to tell you all that Glenys has made a full recovery: so the holiday was booked for the last two weeks in June (2009). For months I had been looking forward to visiting Little Orchard Village again. The first day of our visit, I overheard Jon, one of the owners of the village, telling my owners that the photo fellow was down again on the last week of our holiday. To tell you the truth I was quite looking forward to seeing him, (well he did make me a Star back in 2007), This time he may make me a Super Star! My only worry was that Snoopy was with us again this year. 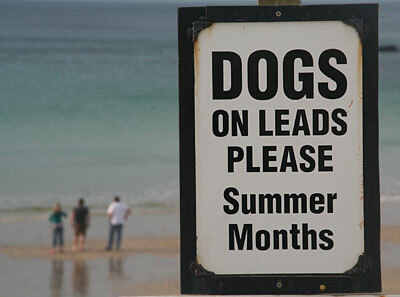 Most days I took my owners down to Trevaunance Cove, This beach is open to us dogs all year: but in the summer, our owners are requested to keep us on a lead. (see the picture at the bottom of this page). 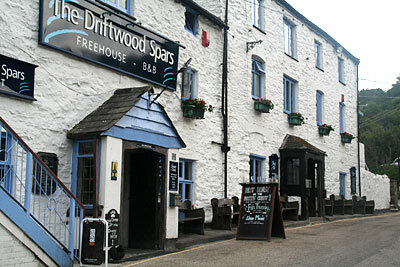 We also visited 'the Driftwood Spars' which is a very canine friendly, with a doggy bowl outside. made from an old motorbike helmet, and selling doggy chews inside. I went on long walks using some of the many footpaths that surround Little Orchard Village. Then on the penultimate day (that's a long word for me, but then I have tried to become more sophisticated now that I'm a star) this photo chappy joined us on the lawn. 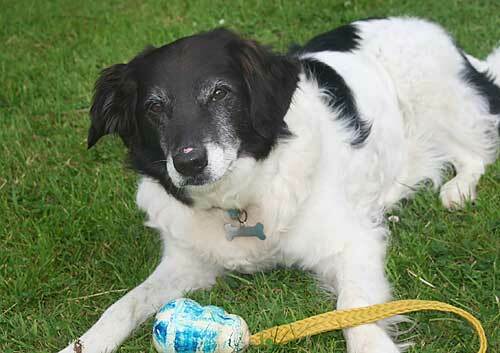 To start with he just chatted to my owners over a few glasses of wine. Then it was my turn, he started to take pictures of me by myself. Then my owner's grand-daughter arrived and the photo session continued. All was going so well, more photos for my portfolio to make me a super star. Then, (yes surfers you're one step ahead of me) Snoopy arrives. That's now the second time that he has stolen the limelight from me! I have been told that with the update to this page on the World-Wide-Web I would become a Super Star. Footnote - If any canines, are reading this page, who want to become a Star, this photo Chappy will be down in Little Orchard village again in the first week of November. So persuade your owner to book. But be warned to become a super star you have to be photographed on two occasions. Well it's the least I can do now that I'm a Super Star to help others up the ladder, I'm just naturally a kind sort of Dog. Little Orchard, very dog friendly. 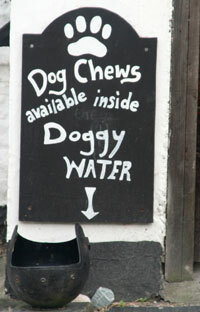 Please Note - Dogs must be kept under control at all times, when at Little Orchard Village.